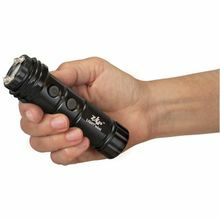 Mini Stun Flashlight less than 5 inches long. This is one cool stun gun flashlight combination. Less than 5 inches long it sports a powerful stun gun engine with a super bright led flashlight. Made by the same company known for it innovative stun defense products like the Zap Cane, this new mini fits the bill perfectly for a small, concealable flashlight that also serves as a powerful self defense stun gun with 800.000 volt output.